DEBORAH CROMBIE: If you love an absolutely unputdownable read, you have cause to celebrate! 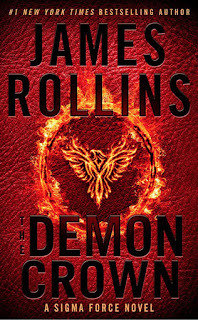 There’s a new JAMES ROLLINS SIGMA FORCE novel out this week! 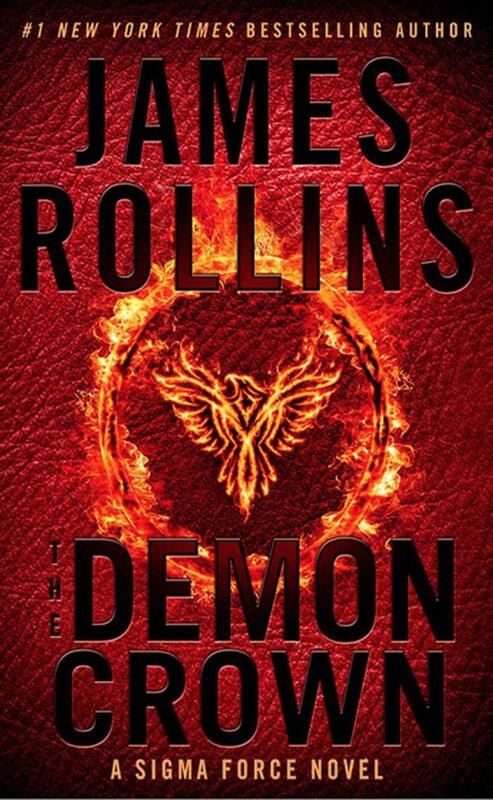 Nobody writes a combination of intriguing science, well-researched history, and breathtaking adventure like Rollins, and I can’t wait to curl up by the fire and dive into this one. I asked Jim to tell us a little about the book. I've got goosebumps just reading about it. DEBS: THE DEMON CROWN is the 13th Sigma Force novel. What new menace is threatening the planet? JAMES ROLLINS: To quote my editor: This book is Sigma’s most frightening adventure to date. And I don’t disagree. The novel starts when a group of scientists stumbles across an island off the coast of Brazil, where all life has been eradicated, consumed and possessed by a species beyond imagination. Before they can report their discovery, the scientists are attacked and killed. Save one, an entomologist, an expert on venomous creatures. This one event soon blows up into a global threat, when the same species is unleashed across the Hawaiian Islands. As people die by the hundreds, it appears the only way to halt the organism’s spread is to nuke those islands. To prevent that from happening, Sigma Force must discover the terrifying origin of the species—and find a way to destroy it. But already the organism is changing, growing, spreading—adapting and surviving every attempt to stop it. So, yes, it is indeed a frightening story—especially so because of how real this danger actually is. Even Homeland Security maintains the threat raised in this novel to be a top priority. DEBS: Can you tell us a little about the heroes of your stories? Who are Sigma Force? JIM: Sigma Force is a team of former special forces soldiers who have been drummed out of the service for various reasons. But because of special aptitudes and abilities, they’ve been recruited in secret by DARPA—the Defense Department’s research-and-development agency—and retrained in various scientific disciplines to act as field agents for DARPA. Their mission is to protect the globe against various emerging threats. Basically, they’re scientists with guns. DEBS: What is the real-life scientific danger in THE DEMON CROWN that could keep Homeland Security up at night? JIM: Specifically, the threat posed by invasive species, those foreign invaders to our shores. We’ve already seen how the Everglades are being overrun by pythons that are wiping out our native bird populations. Then there are Asian carp in our lakes and rivers doing the same to native fish. And it’s not just here in the States. Other examples of invasive species are plentiful and global. Most of these cases are due to accidental contaminations. What worries Homeland Security is that some hostile power might weaponize such a species and use it as means of waging war. Especially as such a threat is nearly impossible to defend against. It’s just that kind of frightening scenario that I explore in THE DEMON CROWN. DEBS: You love to include intriguing concepts in your books. What can readers expect to discover in your newest novel? JIM:This novel serves as a cautionary reminder that we are not living in the Age of Man, but rather—as has been true for over 400 million years—we are living in the Age of Insects. In fact, it is now hypothesized that insects contributed—if not led—to the extinction of the dinosaurs. How? You’ll have to read the book for the shocking answer. But of course, this then begs the question concerning the insects’ latest competitors for the earth’s dwindling natural resources: Could we be their next target? DEBS: You also fold fascinating bits of history into your stories. In this case, you deal with the mysteries surrounding the founding of the Smithsonian Institution in D.C. What made you choose to include this bit of history? JIM: Mostly because so little is truly known about the man who founded the Smithsonian. James Smithson was a British chemist who never set foot in America, yet left his fortune to our young nation in order to establish this institution that would carry his name. He did so without warning or explanation. Then shortly after the founding of the Smithsonian, its first building—the Smithsonian Castle—was nearly destroyed by a fire during the Civil War. Most of Smithson’s books and journals, along with his vast mineral collection, were destroyed, all but erasing his heritage. Then even more intriguingly, the inventor of the telephone, Alexander Graham Bell, defied the regents of the Smithsonian to sail to Europe. On New Year’s Eve in 1903, under the cover of a snowstorm, he stole the bones of James Smithson from a graveyard in Italy and returned them to the States, where those bones reside today in the Smithsonian Castle. To me, Alexander Graham Bell could’ve been a member of Sigma Force. Here we have a scientist and inventor who was not above a little skullduggery…in this case, literally. In fact, many true-to-life mysteries surrounding those stolen bones are critical to the story. DEBS: You are also active in your support of American veterans. Could you tell us a little bit about your efforts? JIM: Sure. My support for veterans first came about after I participated in a USO tour of authors to Iraq and Kuwait in the winter of 2010. Upon coming home, I knew I wanted to do more. First, I worked with USA Cares, which raises emergency funds for vets in need, then most recently I joined US 4 Warriors as an advisory board member. The new charity started as a grassroots effort in San Diego and has since expanded nationwide. Besides helping to promote the social welfare of vets in a wide spectrum of activities, the latest endeavor also involves helping veterans tell their stories…and get published! So as a writer, I’m especially exciting as US 4 Warriors expands into this adventure. DEBS: Here's more about THE DEMON CROWN. DEBS: Like Jim, I grew up loving adventures stories. And like Jim, I loved science, and animals. (Did I mention that one of Jim's characters is a military working dog?) Readers, do you love adventure stories? What are some of your favorites? Congratulations on the new book, Jim . . . like Debs, I am excited to have a new Sigma Force story to read. Do you have a favorite Sigma Force book? Wow, I knew something of the background of the Smithsonian [which is an amazing place], but I’d never heard about Alexander Graham Bell stealing James Smithson’s bones . . . .
It’s wonderful to read about your efforts to help veterans . . . .
As for adventure stories, I love a good adventure, and if it happens to be wrapped around a mystery, so much the better. I always enjoy J. D. Robb’s Eve Dallas stories and Lee Child’s Jack Reacher tales. Other adventures I’m fond of include Tom Wolfe’s “The Right Stuff,” and astronaut Scott Kelly’s “Endurance” . . . .
Congratulations on the newest book, Jim. Yes, invasive species are a big issue. We deal with several plant and animal invasives in the Great Lakes Region where I live such as zebra mussels and purple loosestrife, but none as dangerous as the ones in your book! I had no idea about the origins and history of James Smithson and the founding of the Smithsonian. And I love reading adventure stories/thrillers esp as a teenager. Does anyone remember the thrillers by Desmond Bagley that were published in the 1980s? More recently, I enjoyed adventures thrillers by Boyd Morrison and (the Ark, Rogue Wave, the Vault). The issue of invasive species is reminding me of our trip to Hawaii. The flora AND the fauna that were originally there have pretty much been eradicated. It's why it takes so long to get in and out of their airports... they really check you, as I recall make you wash the soles of your shoes. My love of adventure stories goes way back to Robinson Crusoe. This book sounds so cool Jim! I love stories like this. So, insects helped eradicate dinosaurs? I have to find out about this. At one time I volunteered in our butterfly center and showed bugs to kids and their parents. Sound so terrific ! We did a story about invasive species— and got to go behind the scenes at the airport in the customs and border protection rooms where they keep all of the seized items. So creepy and buggy! Downright scary. Plus, James, there is such a brilliant idea in your post that I am thinking about——hmm. Thank you for all you do for the troops! Let us know how we can help, okay? James, I would love to know about your historic and scientific research. Absolutely! Except the good ones, of course. HANK HERE: oh, that was me above. And yes, love to know about the research! Welcome, Jim. I read one of yours a long time ago and enjoyed it, and I'm glad for this reminder to look for more. How important is it to read the Sigma Force books in order? This one sounds as if it would work as a standalone, unless there are multi-book story arcs, which I generally enjoy. Thanks! HANK here: Oh, good question! 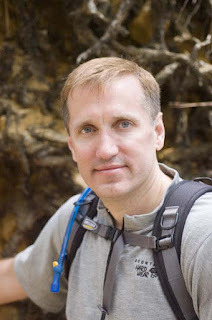 Jim, it's a treat to have you on the blog today. Thanks for sharing the origin of the Smithsonian; I had no idea! How do you get your ideas for your books or, perhaps, how do you decided which idea to pursue given that the world seems fraught with scary possibilities! Okay, DEMON CROWN is going on my Kindle for my holiday in Hawaii. For me, time off is the best time to read thrillers, because I never want to put them down! Also, I should say that James was one of Ross's favorite novelists. I have a whole stack of SIGMA FORCE books stocked up in his bookcase. Enjoy Hawaii, Julia! This sounds like a great book with which to enjoy some beach time. We did a lot of research when I worked as the librarian at the Desert Botanical Garden on invasive species (botanical, obviously), specifically on how they infiltrate grazing lands for cattle in the high country. Fascinating premise for a thriller, James! Jim, I'd love to know more about your research, too. And Julia, how wonderful that Ross loved Jim's books. I can see why he would have enjoyed them.